Vegetable Rice Pilaf or Pulao is an easy one pot rice dish mixed with a variety of vegetables and mildly flavored with various spices. We will make this in the Instant Pot. You can also use the same recipe to make it in a traditional pressure cooker. As you can imagine, this is a one pot dish and hence it is super quick and easy. I make this on any day after I come back from work and don’t have much time to get dinner on the table. The best part is that this is not only a quick meal, it is also very nutritious. We are adding loads of vegetables and you can choose to add veggies of your choice. I added a mix of carrots, green beans, green peas, edamame and corn. Looking for other easy Instant Pot Indian Recipes? Here are 29 Best Instant Pot Indian Vegetarian Recipes for you to try! I usually don’t use the rice mode in the instant pot to make basmati rice. Instead the manual mode works perfectly and also takes less time. But don’t forget to give some time, about 10 minutes, before you release the pressure manually (5 minutes NPR). Follow the time and do not overcook. I personally prefer each grain of rice perfectly cooked and separated. It should not be mushy. In this recipe, I have used frozen vegetables. But you can also use fresh vegetables. Add roasted cashews for additional goodness. You can add them before pressure cooking to the rice. 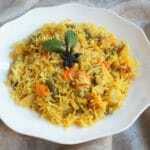 Rice Pilaf with vegetables can be a complete meal for busy evenings. Serve it with yogurt, which helps to compliment the spice in the pilaf. 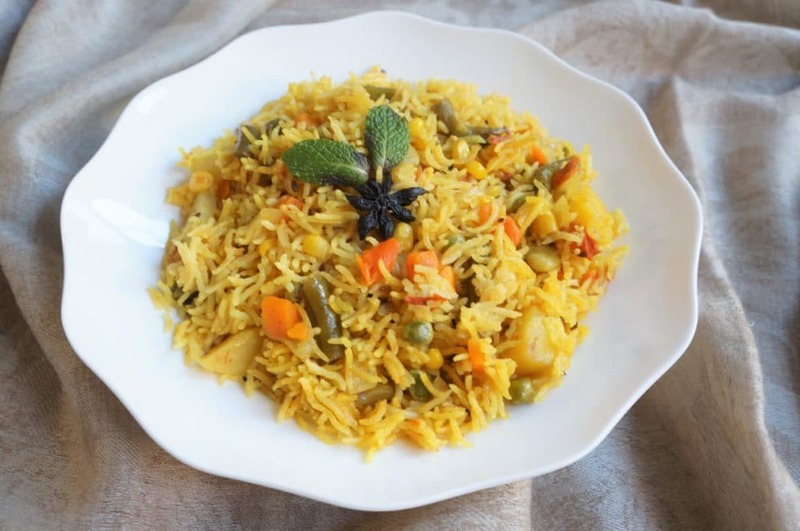 Veg Pulao or Vegetable Pilaf is an easy one pot rice dish mixed with a variety of vegetables and mildly flavored with spices. Start the instant pot in sauté mode and heat it. Add ghee, whole spices and sauté them for 30 seconds until the cumin seeds change color. After they start to splutter, add the green chili, onion, ginger and garlic. Sauté for 2 minutes until onion turn transparent. Add tomato and spices. Mix well. Add potato and mixed vegetables. Mix well. Add the rice and water. Mix the rice with the vegetables. If anything is stuck to the bottom of the pot, deglaze it. Close the lid with vent in sealing position. Change the instant pot setting to MANUAL or pressure cook mode for 4 minutes at high pressure. When the instant pot beeps, do a 10 minute NPR. This means let the pressure release naturally for 10 minutes, then release the pressure manually. Fluff the rice gently. Vegetable Pilaf is ready. Enjoy with homemade yogurt or raita. Note: Remove the insert from the instant pot, so the lower layer of rice does not overcook from the hot base. Adding whole spices is optional. You can enjoy this vegetable pilaf even if you don't have all the whole spices in your pantry. To reduce spice, skip the cayenne. Stovetop Variation: If you don't have an instant pot, you could also prepare this beet pulao in the stovetop pressure cooker. I suggest one whistle for the rice, and let the pressure release naturally. 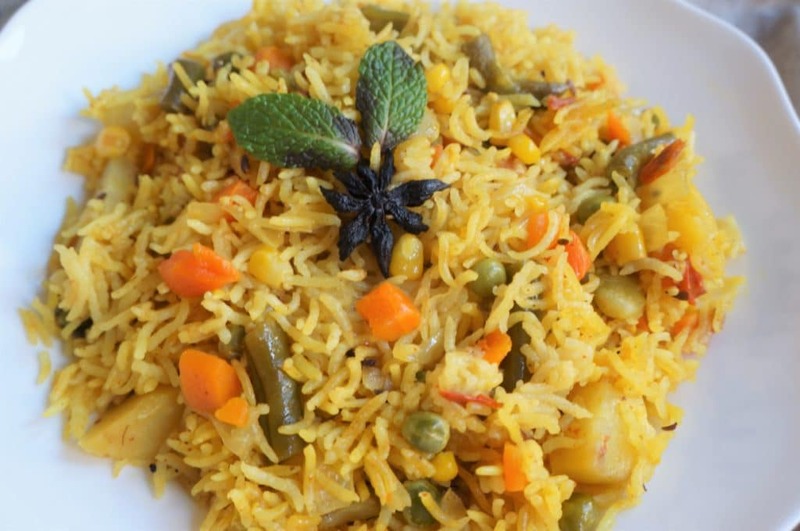 Vegan Variation: Use your favorite vegetable oil to make this pilaf. Hi, If I make it with 2 cups rice, how much water should I use? Hi Kanchan – Just increase the water proportionally to the rice in this recipe and it works well. I have tried this with 4 cups of rice too. Hey Pooja – Soaking could be the reason. If soaking basmati rice, try 1:1 rice to water ratio. Hope you try it again! I made this recipe once and it was so delicious! I am planning to make this once more, but need to double it to accommodate the number of guests. When I made it the first time, it turned out a bit mushy, though I followed the recipe. I actually even only pressure cooked it for two minutes instead of 4, because I was worried about how long it took to reach pressure mode. I was wondering if it turned out a little mushy because the instant pot took some time to reach full pressure mode? Any tips on how to avoid this? Hey Sherin – Glad to hear you liked the recipe. The time it takes to reach pressure is needed and incorporated in the cooking time, so that is not the issue. One thing that can help is to remove the steel insert from the instant pot as soon as you open the lid. So the lower layer of rice is not overcooking due to the residual heat. If you are making for guests, remove the rice in a serving dish once cooked (microwavable in case you need to reheat). Also I do not soak the rice for this recipe. I have done 4 times of this recipe for friends, but did these changes I suggested and it worked well. I would love to hear how it works out when you try again! 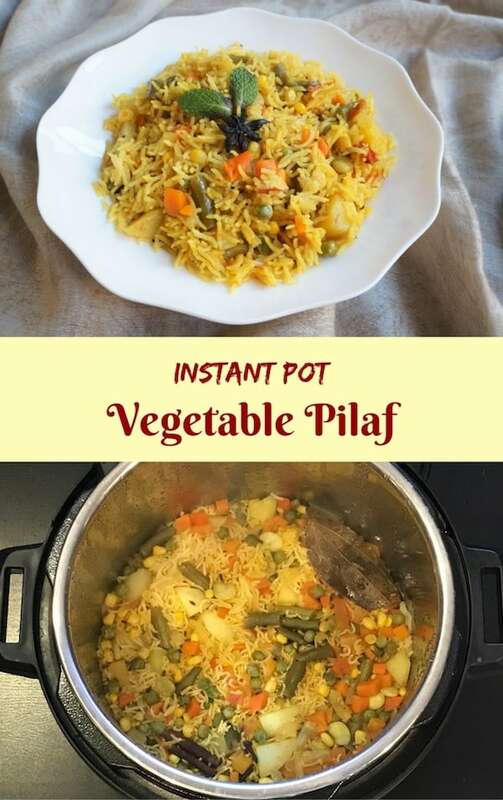 Used instant pot for the first time with this yummy veg pulao. It came out really well. Very tasty. Thank you so much, love it. 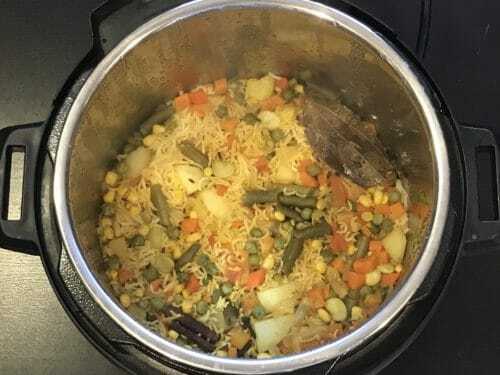 Hey Hima – So glad you inaugurated your instant pot with this pulao and enjoyed it. Thank you for sharing back your review. 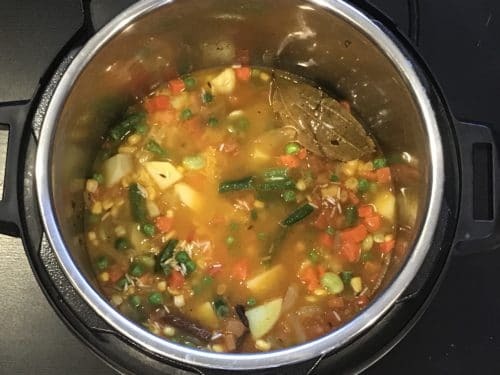 Hello Varsha – I have made this recipe in a 6qt with 4 cups of rice at one time and it has worked perfectly. Just increase the ingredients proportionally – double or triple. I have never tried freezing this pulao, so it is hard for me to confirm it will work well. Hope you and your guests enjoy it! I have done this twice and loved it. When tripling the ingredients for larger group did you also triple the cooking time ? Hey Prajna – The cooking time will remain the same even if you triple the recipe. One tip for large quantity is to remove the steel insert from the ip so that bottom layer does not overcook with the residual heat from the ip. Hi! I just got a 3 qt duo- mini instant pot. Will this recipe work or should i reduce the quantities? First time ip user here:) and very first rice recipe trying with it. Hey Sivalami – Congratulations on the new instant pot. This recipe should work in a 3qt too. Hope you enjoy it! PLZ suggest…I tried ur recipe a couple of times with 1:1.25 ratio..and tried to make 3 cups (3 : 3.75) in IP ..But always it says “burn” after around 5-6 mins from the time I set it into high pressure for 3min setting (as I said in ur recipe)..Any idea! why is this happening ?? Hey Suga3 – Can you share what type of rice you are using? It is possible it is a different type of rice which needs more liquid (eg. sona masoori). I would suggest to try with 1 cup rice and 1.5 cups water and see if it works better (for sona masoori, readers have suggested 1:2 rice to water ratio). Also what size instant pot are you using? I would love to help you get through the hurdle and get you using the instant pot. Thank you! Hey Sugaathri – This is Meeta here (in case you are confusing with Ministry of Curry). Give 1:1.5 ratio a try. Also make sure there is not much time between adding water and pressure cooking the pulao. Hope that helps! Wow! This has to be the best recipe for the Instant Pot I have tried so far. Quick, easy and delicious. My husband and I just devoured the whole batch in one go. It’s a great way to use leftover veggies on a day you can’t bother standing in the kitchen for too long. Thanks and greetings from Germany! Hello Stephanie – So happy to hear you enjoyed the pulao. This is definitely something we cook frequently when we want a quick one-pot meal. Thank you for sharing back your review! I tried this out and it was yummy. If I make this with 4-6 cups of rice, I assume I double the qty for all ingredients and water. Hello Indu – Thank you! I would increase the ingredients proportional to the amount of rice. I have done a max of 4.5 cups of pulao in a 6qt, so do make sure you are not overfilling the instant pot. The pressure cooking time will still remain the same. This turned out really well! I added a little bit of paneer and it was terrific. Thanks!